As cooler weather approaches, we’re heating things up a bit. 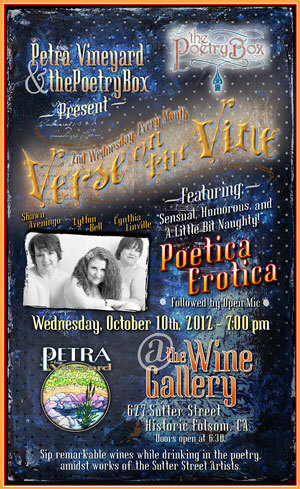 Breathe in the sensual poetry of these three women known as “Poetica Erotica.” Cynthia Linville, Lytton Bell and Shawn Aveningo have been sharing the stories of love, lust, and naughty humor throughout Northern California. Come enjoy musings that stir the soul & the libido.